^ 1.0 1.1 WWE Championship Title History. WWE. [2008-10-17]. ^ Buddy Rogers's first reign. WWE. [2007-03-17]. （原始内容存档于2005-08-28）. ^ WWE Entertainment, Inc. acquires WCW from Turner Broadcasting. WWE Corporate. 2001-03-23 [2008-05-24]. （原始内容存档于2005-04-08）. ^ The complex history of WWE's era of unification. WWE.com (2012-09-12). Retrieved on 2013-09-05. ^ WWWF/WWF/WWE World Heavyweight Title. Wrestling-titles.com. [2007-03-18]. ^ Clayton, Corey. World Heavyweight Championship turns five years old. World Wrestling Entertainment. 2007-09-06 [2008-12-23]. ^ WWE Entertainment To Make RAW and SMACKDOWN Distinct Television Brands. （原始内容存档于2010-04-17）. ^ Brock Lesnar Biography at SLAM! Sports. SLAM! Sports: Wrestling. Canoe.ca（英语：Canadian Online Explorer）. [2008-12-21]. After the July 22nd edition of Raw, Lesnar defected to Stephanie McMahon's Smackdown Lesnar decided to remain exclusively on Smackdown, forcing Eric Bischoff's Raw brand to create its own World Championship. ^ Vince Mcmahon Biography at SLAM! Sports. SLAM! Sports: Wrestling. Canoe.ca（英语：Canadian Online Explorer）. [2008-12-21]. The entire WWE roster was broken up into two separate camps, yahoo, with some rivalry (especially between future General Managers Eric Bischoff and Stephanie McMahon) occurring. ^ Dee, Louie. Draft History. World Wrestling Entertainment. 2007-06-07 [2008-12-21]. ^ 2005 WWE Draft Lottery. World Wrestling Entertainment. 2005-06-13 [2008-12-21]. ^ Sitterson, Aubrey. A Draft disaster. WWE. 2008-06-23 [2008-12-20]. ^ SmackDown results: Truth and Consequences. WWE. [2011-07-30]. ^ Nemer, Paul. Full WWE RAW Results - 9/2/02. WrestleView. 2002-09-02 [2008-12-20]. ^ WWE WORLD HEAVYWEIGHT CHAMPIONSHIP. WWE.com. [16 December 2013]. ^ Murphy, Ryan. 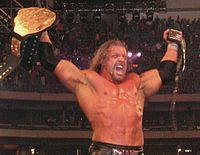 Seven Rare Championships from the WWE Vault. WWE. [2012-09-13]. ^ Robinson, Jon. Edge Interview: 2. [2006-11-18]. ^ Murphy, Ryan. (2013-02-19) The making of the new WWE Title: How the WWE Championship was reinvented in 540 days 互联网档案馆的存檔，存档日期2013-02-22.. WWE.com. Retrieved on 2013-09-05. ^ WWE Raw Results. WWE. ^ [PHOTO-Check-Out-a-Full-Look-at-the-New-WWE-Heavyweight-Title.htm Check Out – a Full Look at the New WWE Heavyweight Title]. 411mania.com. ^ The unification of the WWE Championship and WCW Championship. WWE. ^ WWE Champions. WWE. [2014-05-10]. ^ The esteemed history of WWE Champions photos. WWE. ^ Brock Lesnar receives the new WWE title belt on 'Monday Night Raw'. USA Today. [2014-08-19].